The saga of my wanting to model & animate Daisy in 3D is a bit complicated… so much so that I’ll be splitting it into two posts. The short version is that it’s difficult to rig such a character when your free time is limited, when there’s so much you need to learn in order to rig the character, and when you’re limited by the technology that’s available. 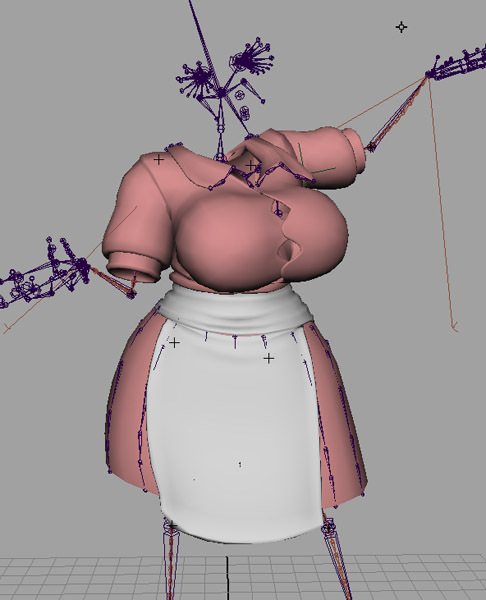 Daisy’s first 3D model was finished back in 2010, but getting there wasn’t easy. I had modeled Mary-Anne a couple of years earlier, and since then had started to learn how to rig characters, as I felt the auto-rigging scripts that were available online at the time were too limited. I was already on the third re-do of Mary’s rig, only by that point Daisy had taken over as my main character, and I wanted to move on. And this was all in addition to working full-time as an animator! Modeling Daisy should’ve been simple. 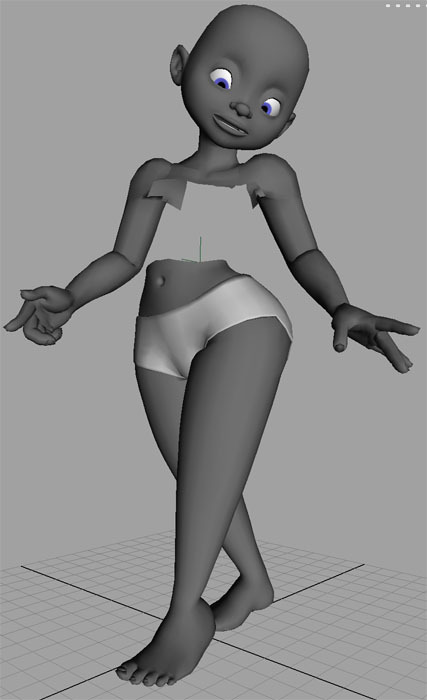 Using Mary-Anne as a starting point, I only needed to use the existing rig to shorten the limbs and torso. I didn’t waste time drawing a model sheet, because I’d been drawing Daisy for a couple of years by that point, I knew what she needed to look like, and more importantly I knew how tall she was relative to Mary. That was all a huge mistake. The problem was that legs on Mary’s model were too long, so using her as a reference point meant that my Daisy model ended up being too tall compared to how I drew her. 01/21/2009 – She could get used to this! By April of 2009, I was nearly finished with Daisy’s rig. 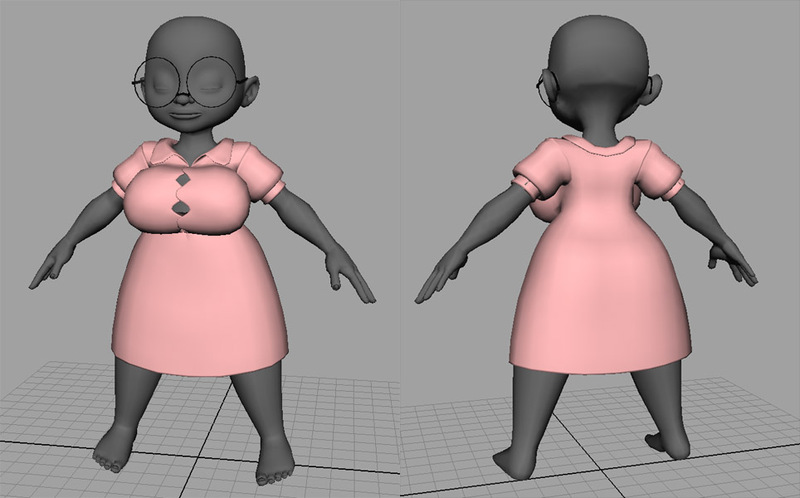 I hadn’t modeled her hair yet, and was preoccupied with rigging her breasts so they’d move with her shoulder, and experimenting with her skirt. By October, I’d finally realized that I’d made Daisy too tall. 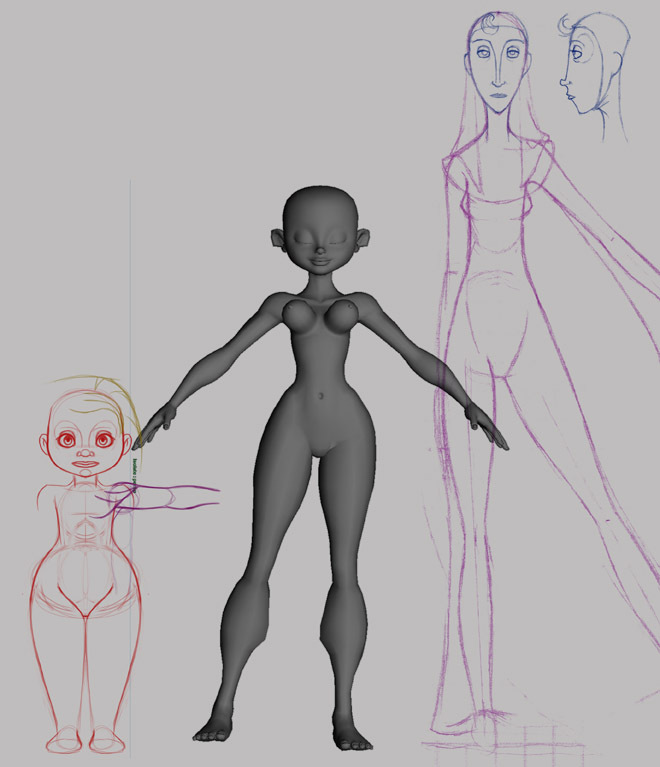 All of the effort that I’d put into her rig now needed to be stripped away, so her height could be corrected. This time, I made sure to draw up some proper model sheets. Fixing her model didn’t take too long, as I was able to use her rig to shorten everything. The blendshapes for her face took longer than the body. Within a month, the update was finished, though I wasn’t too thrilled about having to re-do her rig. 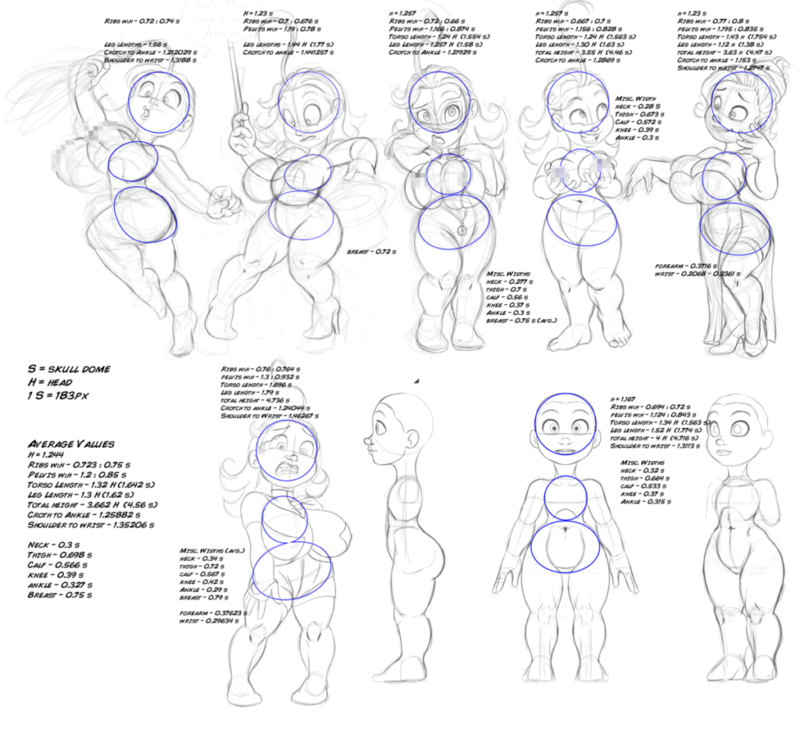 One lesson I learned from this ordeal – other than to always work from a model sheet – was that I should learn how to write my own rigging scripts so I wouldn’t need to rig everything by hand. By 2012, I felt that Daisy’s model was in need of another update. 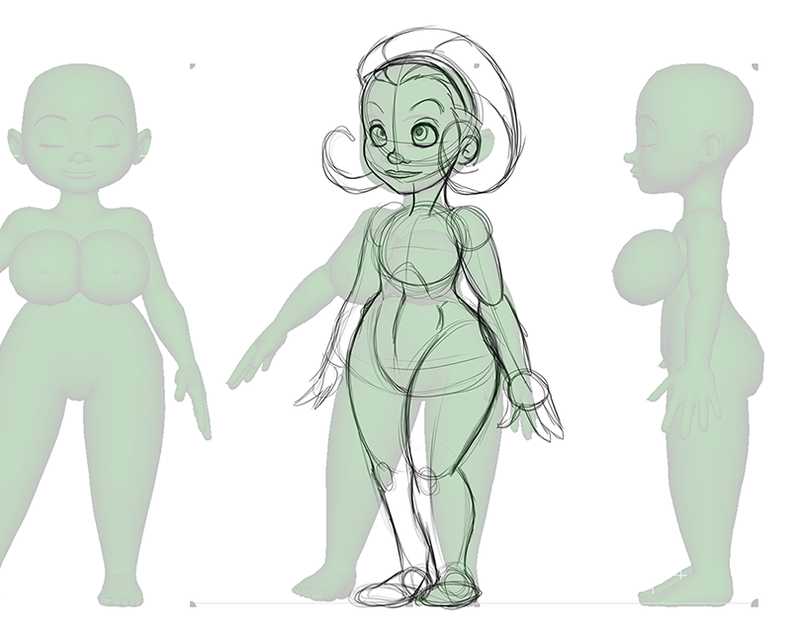 It no longer matched the way I drew her, and, more importantly, her rig was not suitable for animation. I’d started to draw a new model sheet, but didn’t get very far. 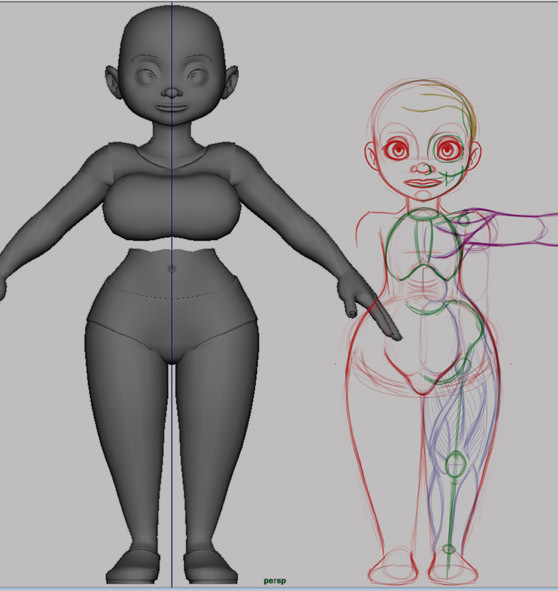 I wasn’t too anxious to jump right into remodeling her at this point, because I still hadn’t solved a rigging challenge that had plagued me since Mary-Anne’s first rig – how to rig breasts to be squishy, but without always relying on dynamics. My options were limited, because I was still using Maya 7, which lacked many features that would make Daisy’s breast rig possible. In 2013 I decided to take a break from Daisy, to focus on Rose. Being tall, thin, and flat-chested meant she would be much easier to finish, which also meant I could test out the script I’d written to rig arms & legs. Between everything else, though, I’d drawn up a proper model sheet to model Daisy from! 2014 was the year I’d finally committed to remodeling Daisy. I still hadn’t solved the breast rigging problem, but I would worry about that when I got to it! Unfortunately, the model sheet I’d drawn up the year before needed to be discarded, because how I drew Daisy had changed quite a bit in the time since. All of those measurements may seem like overkill, but part of it is simply that model sheets for 3D are far more mechanical & lifeless than a normal character drawing. It’s such an unnatural way of drawing a character, that it’s difficult – for me, at least – to keep everything consistent with how the character is supposed to look. 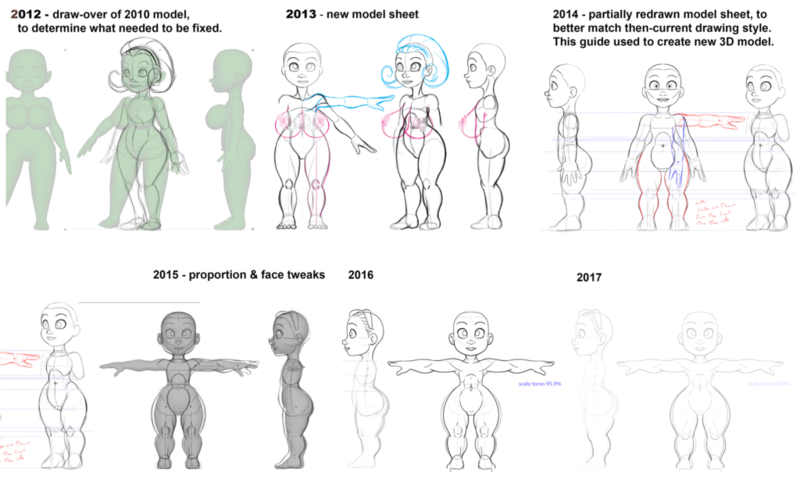 That wouldn’t be the last time I’d update her, either – at least once a year between then an now, I would check the model against my latest drawings, and decide that the model – and model sheets – needed to be updated yet again. Fortunately this only means minor tweaks to the model, rather than a complete do-over. Since I’d started, she’s gotten shorter, wider, and bustier! Daisy’s model getting updated each year is only part of the story. By 2016 I’d decided that I needed more than just a script to set up arms & legs – I needed a tool that could speed up the rigging of the entire body, and keep things consistent between multiple characters. Or at the very least, if I’m going to continue updating Daisy’s model, I’d like to easily be able to rebuild the rig. Getting there has been its own journey, which I’ll cover in another post. even her hair has gotten thicker!